WILMOT, MONTAGU, military officer, governor of Nova Scotia; place and date of birth unknown; son of Christopher Wilmot and Anne Montagu; d. 23 May 1766 at Halifax, Nova Scotia. Montagu Wilmot’s father was physician-in-ordinary to George II when he was Prince of Wales, and his mother was a daughter of Edward Montagu, of Horton, Northampton, England, and a sister of George Montagu, 1st Earl of Halifax. 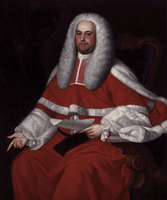 Thus Wilmot was a cousin of George Montagu Dunk, 2nd Earl of Halifax, president of the Board of Trade and secretary of state; Lord Halifax was Wilmot’s patron. Wilmot began his military career in April 1730 as an ensign in the 18th Regiment of Foot (Armstrong’s). He was promoted lieutenant in the 5th Regiment of Marines in November 1739, captain in the 15th Foot in April 1741, and major in Lord Halifax’s regiment in October 1745. At that time he was transferred to the 29th Foot (Hopson’s) and likely joined it at Louisbourg, Cape Breton Island, where the regiment had been sent from Gibraltar to form part of the British garrison at the recently captured fortress. In the summer of 1749, Louisbourg having been restored to France, the regiment was posted to the newly founded settlement at Halifax, Nova Scotia. 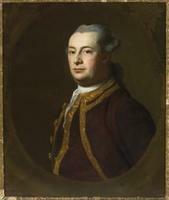 Wilmot was promoted lieutenant-colonel in the 45th regiment (Warburton’s) in April 1755. In December he was appointed a member of the Nova Scotia Council. After the French success at Fort Oswego (Chouaguen) in August 1756 [see Montcalm], it was decided to strengthen Fort Cumberland on the Chignecto isthmus of Nova Scotia. On 12 November Wilmot was sent by Governor Charles Lawrence to take command of the garrison there, along with 200 soldiers from the Halifax garrison. He was later accused by a trader at Fort Cumberland of illegally paying bounties on French scalps brought there by the Indian rangers of Joseph Gorham*. At the siege of Louisbourg in 1758 Wilmot commanded the 4th brigade, comprised of the 45th and 22nd regiments and the 3rd battalion of the 60th regiment. 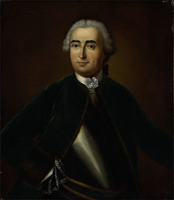 He remained at Louisbourg for a time after the capture of the fortress, and may have taken part in the recapture of St John’s, Newfoundland, from the French in 1761. In the spring of 1762 he was made lieutenant-colonel of the 80th regiment and moved to Quebec. 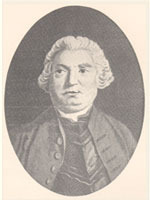 Wilmot was appointed lieutenant governor of Nova Scotia on 14 March 1763, succeeding Jonathan Belcher*, but did not arrive at Halifax from Quebec until September. 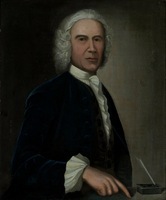 That fall Henry Ellis resigned the governorship of Nova Scotia, and in May 1764 Wilmot assumed this office. The province was suffering from heavy debts and deficits when he became governor, for almost the whole British naval and military establishment had been withdrawn from Halifax, and with it the revenue from duties on the sale of liquor. The British parliamentary grant had been drastically reduced in recent years as well. Wilmot was repeatedly warned by the Board of Trade to avoid extravagant expenditures such as those made while Belcher was in office. During Wilmot’s régime between 2 1/2 and 3 1/2 million acres of provincial land were granted, unwisely, to local and foreign speculators, although it is unfair to blame Wilmot alone for this activity. A royal proclamation of 7 Oct. 1763 had encouraged settlement in Great Britain’s newly conquered possessions of Florida, Quebec, and Nova Scotia – which now included Cape Breton and the Island of St John (Prince Edward Island) – and forbade settlement west of the Appalachians. Wilmot protested that these new instructions, which offered unlimited grants and imposed few responsibilities on the grantees, opened the way for speculation. He delayed making new and large grants to Alexander McNutt*, a major speculator, and appealed to the Board of Trade for more stringent regulations; the board failed to reply. Wilmot finally granted McNutt’s request for land in the fall of 1765, but insisted that if some settlers were not placed upon any grant within four years it could be escheated by the crown. Halifax County Court, Papers, Inferior Court of Common Pleas, 1769, John Butler [administrator of estate of Governor Wilmot] v. Joseph Pierpoint. Halifax County Court of Probate, Estate papers, W96. Harvard College Library, MS Sparks 4, Bernard papers, III, 7. Nova Scotia, Dept. of Lands and Forests, Crown Land papers, V, 5, 207; VI, 34, 535, 546, 762; VII, 190. PANS, RG 1, 31, nos.22–56; 37; 41; 42; 163/3, pp.87–90; 164/2, pp.222–38; 165, pp.281–413; 166, p.8; 286, nos.17, 18, 20, 48, 56; 349, nos.9–10; RG 3, Minutes of Nova Scotia Council, 1755–56, 1763–66; F.-J. Audet, “Governors, lieutenant-governors, and administrators of Nova Scotia, 1604–1932” (bound typescript, n.d.). PRO, CO 217/20, ff.215–388; 217/21, ff.1–394 (mfm copies in PAC and PANS); Ind. 5435, 5438. St Paul’s Church (Halifax), “Record of burials performed by the clergy of St Paul’s Church gathered from loose memoranda, and written up by W. Simms Lee”; Burial records, 1766 (mfm at PANS). Army list, 1758, 92. Knox, Historical journal (Doughty). Nova Scotia, A journal of the votes of the Lower House of Assembly, for the Province of Nova Scotia [1763–66] (Halifax, [1763–66]). PRO, JTP, 1759–1763; 1764–1767. Joseph Foster, The peerage, baronetage, and knightage of the British empire for 1881 ([London], n.d.), 663. Record of services of the officers of the 1st and 2nd battalions the Sherwood Foresters, Nottinghamshire and Derbyshire Regiment, 45th and 95th, 1741–1931, comp. H. C. Wylly (n.p., ). Brebner, Neutral Yankees. Murdoch, History of Nova-Scotia, II, 321, 431, 432, 437, 439, 441, 443, 460. Margaret Ells, “Clearing the decks for the loyalists,” CHA Report, 1933, 43–58. J. S. Macdonald, “Richard Bulkeley,” N.S. Hist. Soc. Coll., XII (1905), 70–72. Phyllis R. Blakeley, “WILMOT, MONTAGU,” in Dictionary of Canadian Biography, vol. 3, University of Toronto/Université Laval, 2003–, accessed April 20, 2019, http://www.biographi.ca/en/bio/wilmot_montagu_3E.html.